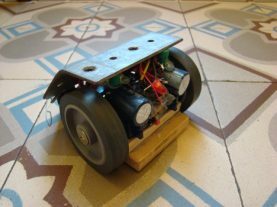 Dies ist mein Sumo-Ringer-Roboter, den ich unter Anleitung des Buches “Junkbots, Bugbots & Bots on Wheels” (Dave Hrynkiw, Mark W. Tilden; Osborne Verlag) gebaut habe. Sein “Gehirn” besteht aus zwei DPDT (Double Pole, Double Throw) Relais. An der Front des Roboters befindet sich ein SPDT (Single Pole, Double Throw) Taster, der gedrückt ist, wenn er normal fährt. Gelangt er nun an die Grenze des Tisches oder Kampfrings, so öffnet er sich, und der Roboter fährt kurze Zeit Rückwärts und dreht sich ca. 150° nach links, um anschließend wieder vorwärts zu fahren. Zudem sind vorne rechts und links ebenfalls SPDT-Taster befestigt, an denen jeweils eine Drahtschlaufe gelötet ist. Kommt nun der gegnerische Roboter oder ein Gegenstand gegen einen der Taster, sodass er gedrückt wird, wird jeweils der Stromfluss des gegenüberliegenden Servo-Motors unterbrochen, damit das Hindernis automatisch aus dem Ring geschoben wird. 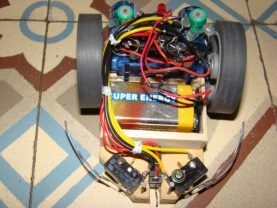 I built my Sumo robot with the help of the book “Junkbots, Bugbots & Bots on Wheels” (Dave Hrynkiw, Mark W. Tilden; Osborne publishing). Its “brain” consists out of two DPDT (Double Pole, Double Throw) Relais, that controls the main behavior of the robot. 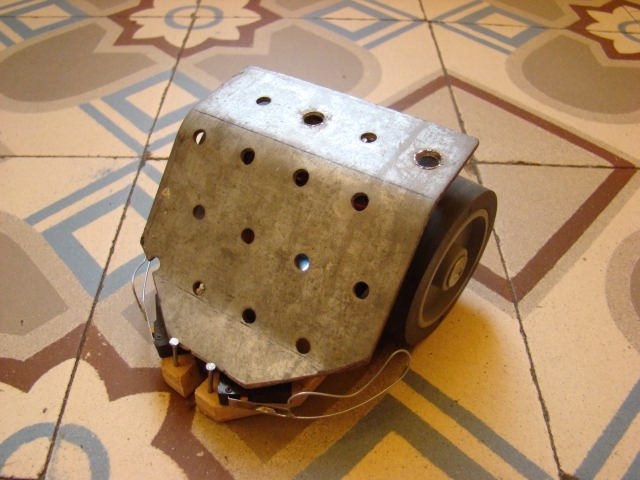 There are three SPDT (Single Pole, Double Throw) switches attached to the front of the robot. The one in the middle is the edge detector. When the robot is driving on a flat surface, the switch is normaly closed. But when it reaches the edge of a table or the sumo ring, the switch opens and the robot drives back for a moment. Then it turns about 150° degrees left to drive forward again. The right and left SPDT switches are the controling sensors for pushing the opponent out of the sumo ring. If one of them gets pressed, the servo on the opposite will stop turning. For this reason the robot seems to turn automatically in the direction of the oponent.